Cyclic adenosine monophosphate (abbreviated cAMP) was the first "second messenger" to be discovered and is the best understood. 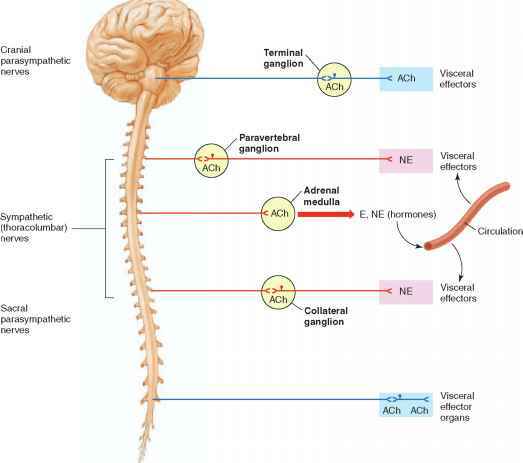 When epinephrine and norepinephrine bind to their P-adrenergic receptors (chapter 9), the effects of these hormones are due to cAMP production within the target cells. It was later discovered that the effects of many (but not all) polypeptide and glycoprotein hormones are also mediated by cAMP. ■ Figure 11.8 The adenylate cyclase-cyclic AMP second-messenger system. 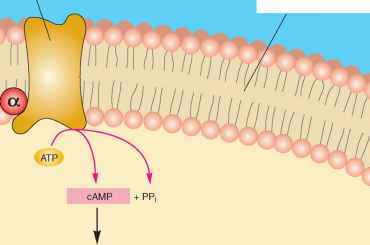 The hormone causes the production of cAMP within the target cell cytoplasm, and cAMP activates protein kinase. The activated protein kinase then causes the activation or inactivation of a number of specific enzymes. These changes lead to the characteristic effects of the hormone on the target cell. therefore, the intracellular concentration of cAMP is increased. Cyclic AMP activates a previously inactive enzyme in the cytoplasm called protein kinase. The inactive form of this enzyme consists of two subunits: a catalytic subunit and an inhibitory subunit. The enzyme is produced in an inactive form and becomes active only when cAMP attaches to the inhibitory subunit. Binding of cAMP to the inhibitory subunit causes it to dissociate from the catalytic subunit, which then becomes active (fig. 11.8). In summary, the hormone—acting through an increase in cAMP production—causes an increase in protein kinase enzyme activity within its target cells. Active protein kinase catalyzes the phosphorylation of (attachment of phosphate groups to) different proteins in the target cells. This causes some enzymes to become activated and others to become inactivated. Cyclic AMP, acting through protein ki-nase, thus modulates the activity of enzymes that are already present in the target cell. This alters the metabolism of the target tissue in a manner characteristic of the actions of that specific hormone (table 11.4). 1. The hormone binds to its receptor on the outer surface of the target cell's plasma membrane. 2. Hormone-receptor interaction acts by means of G-proteins to stimulate the activity of adenylate cyclase on the cytoplasmic side of the membrane. 3. Activated adenylate cyclase catalyzes the conversion of ATP to cyclic AMP (cAMP) within the cytoplasm. 4. Cyclic AMP activates protein kinase enzymes that were already present in the cytoplasm in an inactive state. 5. Activated cAMP-dependent protein kinase transfers phosphate groups to (phosphorylates) other enzymes in the cytoplasm. 6. The activity of specific enzymes is either increased or inhibited by phosphorylation. 7. Altered enzyme activity mediates the target cell's response to the hormone. 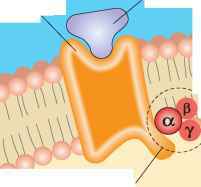 Where is cyclic amp on plasma membrane? Which hormones use adenyl cyclase as second messsenger? How cyclic amp is produced within a target cell? What is the name of the enzyme that inactivates cyclic adenosine monophosphate? What causes an enzyme system to become inactivated? When a g protein becomes activated and causes an activation of enzymes? Which of the following substances inactivates cyclic AMP? WHAT IS THE H ORMONE THAT BINDS TO MEMBRANE RECEPTOR ON ON THE CYCLIC ADENOSINE PHOSPHATE? What is the enzyme that inactivates cyclic adenosine monophoshate? Which hormone use cyclic amp? What us the second messengerwhat enzyme inactivates camp? What is the first messenger in the conversion of atp to camp? What is the sequence of the cAMP second messenger system? Why ATP convert into cyclic AMP? Which hormones uses adenyl cyclase cAmp messenger system? Which hormone activates enzyme adenylate cyclase? What are the enzymes that are activated by cyclic AMP?